Our lucuma grows at altitudes around 9,000 ft. (2,750 m) in the Andean valleys of Peru, its birthplace. This region is known for its fertile soils and temperate weather. This exotic Peruvian fruit, also known as the "Gold of the Incas," is considered to be one of the lost crops of the Incas. Thanks to an organic dehydration process with temperature control and subsequent fine grinding, lucuma fruit powder retains its flavorful, nutritional richness. An excellent source of fiber and a good source of potassium and iron. 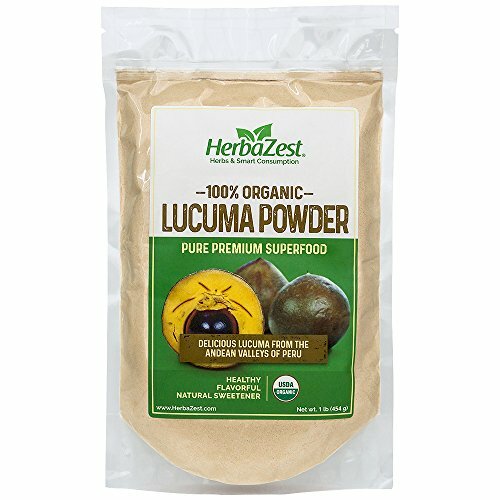 How to use HerbaZest Lucuma Powder? Lucuma's delicious flavor with a maple-like and butterscotch undertone makes it a wonderful addition to ice cream, smoothies, juices, baked goods, yogurt, cereal, and more! ORDER OUR PREMIUM ORGANIC LUCUMA TODAY! NEW/SPECIAL PROMOTION: For a limited time, we are extending our recent launch sale by offering a $2 off coupon. Take advantage of this opportunity today! LOW-SUGAR SWEETENER: Its delightful, exotic flavor can satisfy one's sweet tooth without compromising the waistline. 1 LB (16oz/454g) OF PREMIUM LUCUMA: USDA Organic, Gluten-Free, Vegan, Non-GMO. CULTIVATED IN ITS PLACE OF ORIGIN, the Andean valleys of Peru, and sourced directly from local farmers. EASY TO USE, TASTY & FIBER-RICH addition to smoothies, baked goods, cereal, ice cream, and more! If you have any questions about this product by HerbaZest, contact us by completing and submitting the form below. If you are looking for a specif part number, please include it with your message.